The Carrot Seed seemed like the perfect book to follow The Runaway Bunny and a great way to incorporate more of our spring garden theme. 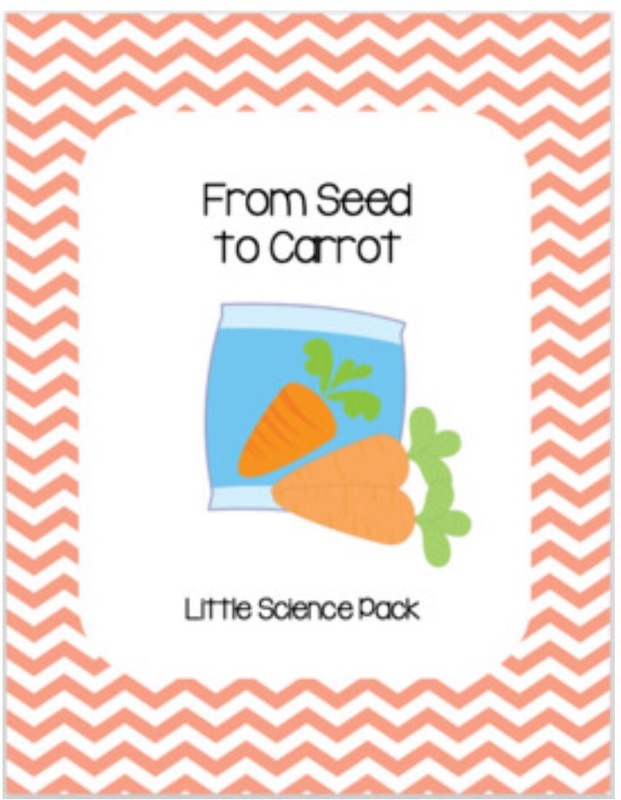 I created The Carrot Seed Pack, because I couldn’t find many printables for this book. You can visit our TPT Store to download many of the printables for FREE (limited time only)! I printed and laminated our vocabulary cards and placed them in our Sensory Story Box. We selected the Kids of Integrity Patience lesson plan for our Bible unit and chose Romans 8:25 to memorize as our memory verse. Parker traced his Bible verse worksheet. He worked on the Bible verse puzzle daily until he could recite it by heart! We used our sensory story bin almost daily. Each day Parker worked on a different matching activity. By the end of this unit he could match each word to its picture card. You can download The Carrot Seed Nomenclature Cards for FREE here (limited time only)! They are also included in The Carrot Seed Pack available for purchase at our TPT Store. Parker used the tracer sheets to practice writing his letters. We brought out many spring and garden themed printables to use for practicing our starting sounds. I created a couple of Carrot Seed phonics activities for Parker to work on. You can download the phonics printables for FREE here (limited time only)! I presented the cards with gems so Parker could mark the starting sounds. I filled carrot containers with the letter tiles needed to spell each word. Parker cracked open each carrot, figured out the mystery word, and did his best to spell them by sounding them out. Our little Learning Lane was bustling with carrot-themed math activities. Parker worked on counting, skip counting, and number recognition activities. We also added fractions, equations, and measuring activities to the mix! I created several math activities to coordinate with this book. Many of the math printables are available for FREE at our TPT Store (limited time only)! Parker worked on The Carrot Seed math printables throughout this row. I made carrot lifecycle bagels to kick-start our carrot lifecycle craft! I also put several carrot lifecycle activities in our Learning Lane. 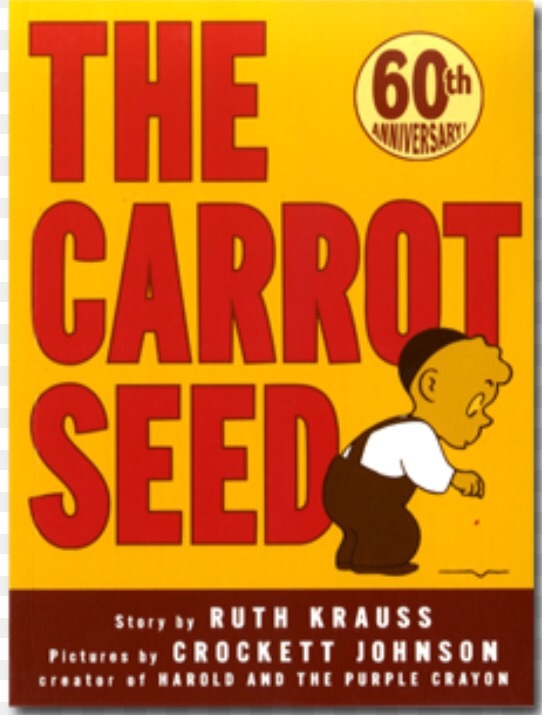 We read several great books about carrots (and vegetables in general). The kids were able to glue the seed pictures in order after learning about the carrot lifecycle. 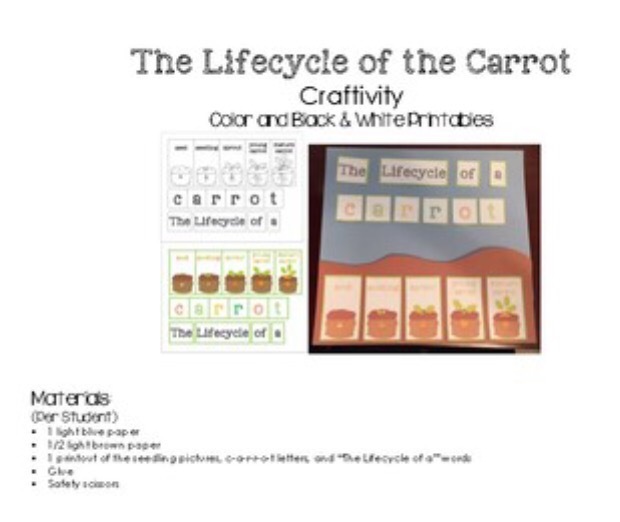 You can purchase The Life Cycle of the Carrot CRAFTivity here at our TPT Store. I found this great “planting carrots” idea online and kept it in our Learning Lane. We read several books about seeds. I created a Carrot Life Cycle Pack for Parker. You can purchase it here at out TPT Store! Parker worked on several pages during this row. We read more carrot and vegetable books. We also made carrot seed houses as both a Bible and science activity. We took a paper towel and sprayed it with water. Next, we added seeds to the damp paper towel. We used pumpkin seeds, because they sprout quickly and transplant well. The kids glued the tops to their carrot and attached their ziplock bag. We added them to the window to watch them sprout! 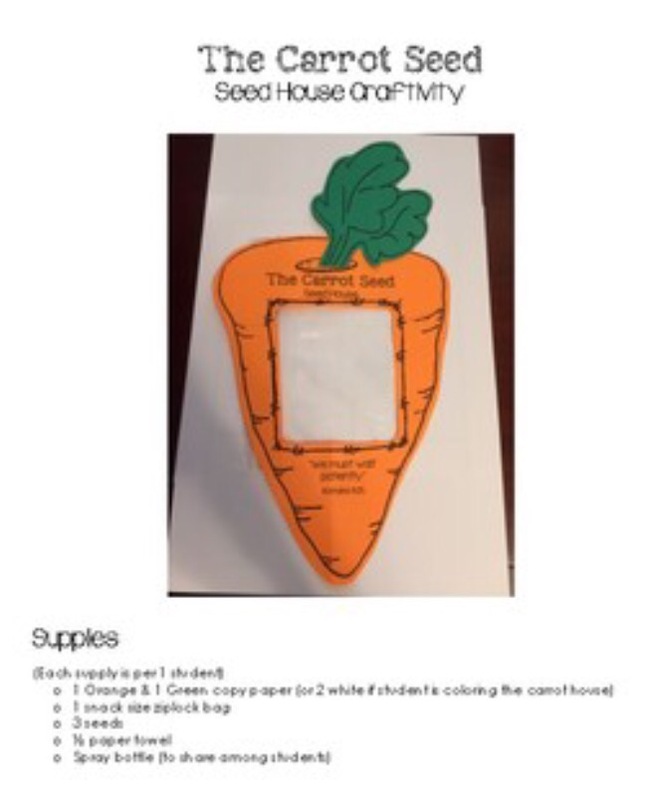 I created The Carrot Seed – Seed House CRAFTivity. You can download this CRAFTivity for FREE at our TPT Store (limited time only)! We HAD to study carrots while rowing The Carrot Seed. I set up a carrot tray for the boys to peel, dissect, and label the parts of the carrot. The boys labeled their parts of the carrot booklet for their lapbooks. When they were done, they munched on their crunchy snack! 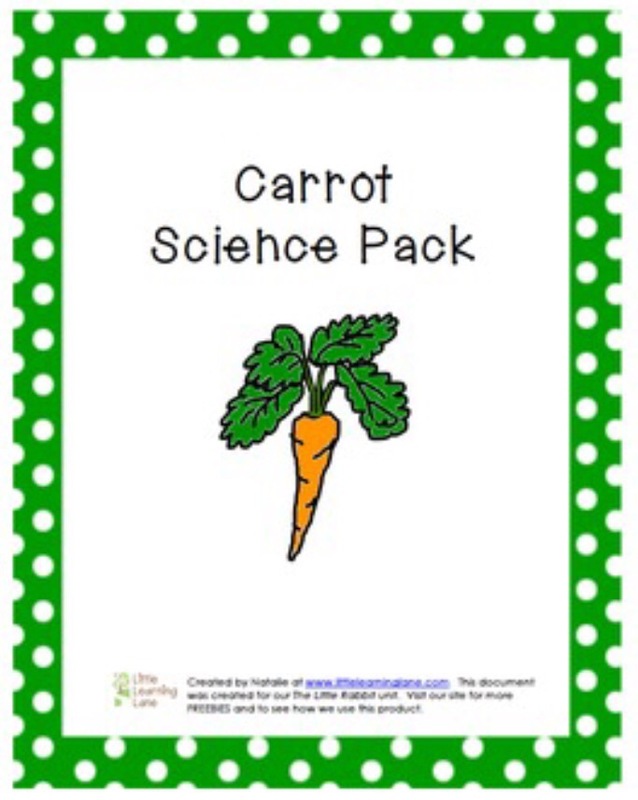 I created a Carrot Science Pack about the various parts of the carrot. You can purchase this science pack here at our TPT Store. We read more garden-themed books, because you can never read too many books! The kids added some Carrot Seed (Homeschool Share) inserts into their lapbooks. We read Carrot Soup made Rabbit’s carrot soup. We read The Giant Carrot and made the carrot bread pudding with rainbow carrots. Parkie tried the yellow one…looks like it passed the taste test! Unfortunately, nothing sprouted, but growing carrots from seeds isn’t always easy. Great lesson on patience and trying again! Check out our Pinterest Board to find the printables we used and many pins that inspired our activities! Watch our The Carrot Seed playlist for a mix of spring-themed read-alouds, songs, science clips and more! Thank you! It is a wonderful program…you should get a copy!